Key California lawmakers said Thursday they've reached an agreement on legislation to enshrine net neutrality provisions in state law after the Federal Communications Commission dumped rules requiring an equal playing field on the internet. California's bill is one of the nation's most aggressive efforts to continue net neutrality, and the deal comes after a bitter fight among Democrats over how far the state should go. 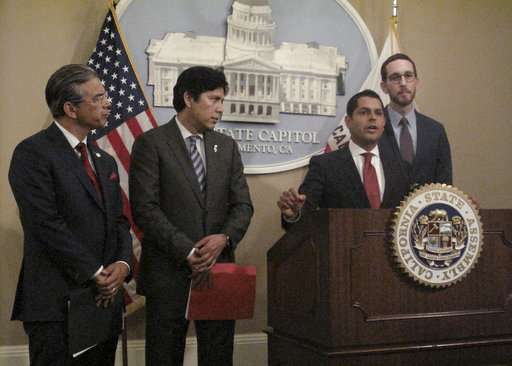 Democratic Sen. Scott Wiener, who repudiated his own legislation when major pieces were removed two weeks ago, said those provisions have been restored under his agreement with Democratic Assemblyman Miguel Santiago. "We need to ensure the internet is an open field where everyone has access, the companies that are providing internet access are not picking winners and losers," Wiener told reporters at a Capitol news conference. Santiago came under fire from net neutrality advocates around the country when the Assembly committee he leads stripped key provisions from the legislation—a decision that drew rebukes from members of Congress, including House Minority Leader Nancy Pelosi. Santiago became the subject of online memes and a flood of calls to his office accusing the Los Angeles lawmaker of selling out to internet providers, citing his contributions from AT&T. Santiago portrayed net neutrality as crucial to the future of the progressive movement and called on other liberal states to follow suit. "There's a lot of blue states in the country," Santiago said. "We expect them to stand up and join us in this fight and pass measures that are equally as strong." Internet companies say it's not practical for them to comply with state-by-state internet regulations and warn that Wiener's bill would discourage the rollout of new technology in California. "For decades, California has benefited from American innovation and investment, but SB 822 is a flawed and consumer unfriendly approach," CTIA, a wireless industry lobbying group, said in a statement. The FCC last year repealed Obama-era regulations that prevented internet companies from speeding up or slowing down the delivery of certain content. Net neutrality advocates worry that, without net neutrality rules, internet providers would be free to block political content, slow down websites from their competitors or drive consumers to their own content. The debate in California is being closely watched by net neutrality advocates around the country, who are looking to the state to pass sweeping net neutrality provisions that could drive momentum in other states. Wiener said the key provisions removed from his bill were restored. One would require data to be treated equally at the point where it enters an internet company's network, not just within the company's own infrastructure. The other bans a practice known as "zero rating," in which internet or cellphone providers exempt certain data from a monthly cap. Critics of the practice say zero rating encourages low monthly data caps and cuts off vast swaths of the internet for people who can't afford higher data allotments. He declined to release the new bill language until lawmakers return in August from a summer break. Under the agreement, Wiener's bill will be linked to separate legislation by Democratic Sen. Kevin de Leon to prohibit state contracting with companies that don't abide by net neutrality provisions.